When going to a gig described as a ‘guitar summit’, one might have perhaps expected a heightened sense of formality and gravitas throughout the performance. In this case, the technical mastery and brilliance of these musicians was something to be taken seriously, but the event also happened to feature a beautiful example of the spontaneity and creativity of jazz. The gig took place at Soho’s Pizza Express, with four jazz guitarists from different backgrounds and generations. The youngest, Nick Fitch, a budding guitar prodigy, rubbed shoulders with the legendary Jim Mullen, who also led the comic entertainment for the night. There was also the internationally-acclaimed Czech guitarist Libor Smoldas, as well as Nigel Price, a formidable guitarist known for his jam-packed CV of constant touring and recording as well as his incredible musicianship. Forming a strong rhythm section to this rare formation was Stephen Keogh on drums and Arnie Somogyi on double bass. Instead of the night featuring a constant sextet line up, there was a high degree of inventiveness in terms of the instrumental collaborations. The two youngest guitarists, Smoldas and Fitch, jammed the first couple of tunes, with evident enjoyment taken in each other’s playing. The grin on Smoldas’ face was plain to see as he effortlessly supported Fitch’s stream of bebop patterns in Donna Lee with perfectly-timed chords and occasional bass-line figures. In contrast to this fast-paced number, the slow ballad Alone Together was more reflective, as the guitarists tested and experimented with each other’s sensibilities through trailing melodic embellishments and the odd ‘surprise’ chord or note at the end of a phrase. The appearance of four different guitarists in one set was also a chance for the listener to really hone in on what made each player’s style so idiosyncratic. Whilst Smoldas’ tone had a more muted, mellow appeal, Fitch’s tone was brighter and clearer. The combination of Mullen and Price, introduced by Mullen as ‘Guitarmaggedon’, made evident the rock and blues influences of their playing. 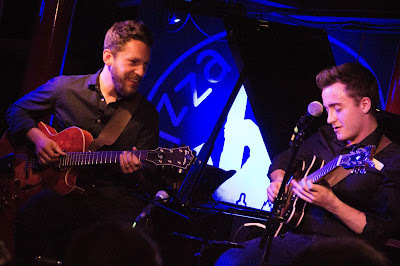 With a long history of collaboration, Mullen and Price were perfectly at ease with each other’s playing as they switched back and forth between comping and soloing, each time taking ideas from the other’s improvisations. An especially heart-warming point of the night was experiencing Fitch and Mullen, separated by a 50-year age gap, take on Mullen’s original composition Medication. The weaving and winding melody of the head, set against fast-paced harmonic changes, made the choice of title all too suitable, and was communicated impressively by Fitch and Mullen in unison. When the four featured guitarists finally came together towards the end of the night, the exchange of ideas during the solos was almost tangible. At this point, the players were more relaxed and warmed up, with the experimentation being less tentative and more convincing. The rhythm section continued to be completely in sync, with Keogh being key in providing an understated but crucial role during the proceedings. Somogyi similarly lent his bass as an undercurrent whilst occasionally taking on the odd chorus. Mullen and Price in particular were noteworthy in their humorous delivery of quotations, which underlined the light-hearted mood to the gig. Overall, it seemed more a ‘celebration’ than a ‘summit’, with the night being dedicated to the late Irish guitarist Louis Stewart. It was fitting to honour his memory above all with the beauty of mutual encouragement and support between players. I was there in the second and for me the greatest joy was experiencing the interaction between the different generations. The look of wonderment on both Nick and Libor's faces as Jim and Nigel created seemingly impossible solos was truly a wonderful and inspiring experience? Jim's wry Scottish humour came to the fore when he retitled that wonderful ballad which we know as Stairway To The Stars as Stairlift To The Stars, an homage to his recent illness which has left him with one foot heavily bandaged substantially reducing his agility and ability to bound up the stairs two steps at a time. All in all a fab evening made even better by the effortless service at the Pizza Express plus a couple of glasses of Merlot as my accompaniment for a unique musical journey.